The latest update is below, with the updated map. Don't forget to sign and date your invoice(s), and complete your application form - any submissions will be returned if our guidelines are not followed. Therefore payment will be delayed. We need this to be done for auditing purposes. Are you on our email contact list? it's faster, easier and less expensive for us to email all updates (rather than printing and posting out), so if you have an email address, please do sign up to receive email updates, at http://eepurl.com/diAxt1… it all helps to save our funds. Thank you. Network 1 Achnasheen—fully commissioned and all premises can order an FTTP service. 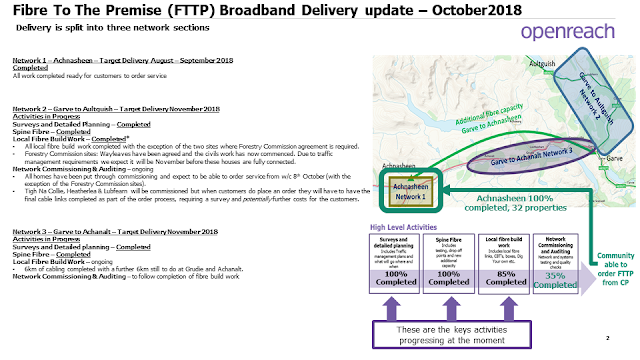 Network 2 Garve to Aultguish—commissioned *premises will be able to order an FTTP service from 8 October. 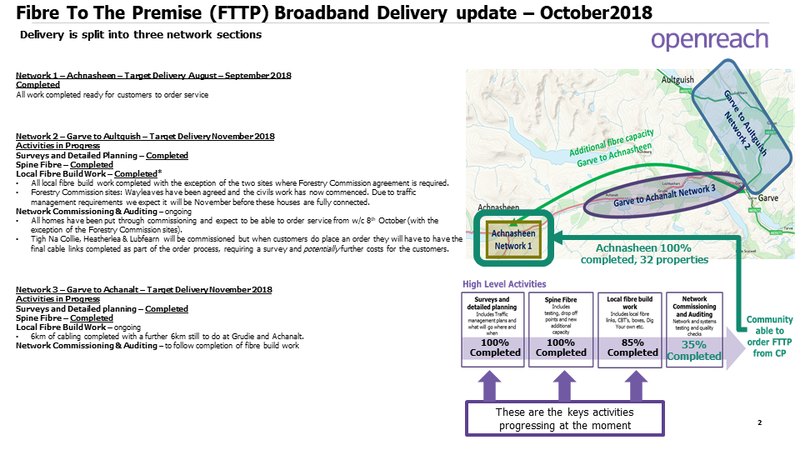 Note: all those in Aultguish to Little Garve—if you didn’t get your selfdig done by end August, then you could still get your service commissioned by the end of the year if you get the selfdig done before the end of October. If you want a service quickly, and don’t want to incur unnecessary extra cost for getting it, then get your selfdig done as soon as possible. BTOR are here in the area – make the most of it. Network 3 Garve to Achanalt—work in progress see map for detail. I decided to continue with BT, but I will review when my contract comes up for renewal, and shop around. Once my order was accepted I was kept informed by email and text on the status. No problem with setting a day/time for engineers to call, and was given the option to change the appointment if it became inconvenient. Connection by the two Openreach engineers was straightforward, the ’box’ fitted in the house, in my office, on the wall, isn’t intrusive (measures approx. 8” x 10”), sits next to the small phone line connection box. New smart hub (6) was provided—easy set up, although the engineers will guide you if you’re not used to dealing with this aspect. They were very helpful/informative. Should only take a couple of hours to install—mine was a little longer as they had to follow the route of the existing cable from the pole to my roof! Not only has it made a difference to my working day—I work from home—but when relaxing and wanting to download a film from my Sky box, instead of it taking a couple of days, it’s now to watch immediately! Same with YouTube videos, no buffering whatsoever! Skype too, and video calling—all excellent! And no drop outs! Wifi signal around the house is excellent! So there you are folks, I’m now in the 21st century broadband-wise. Hope you, too, start to enjoy a more reliable faster broadband soon!